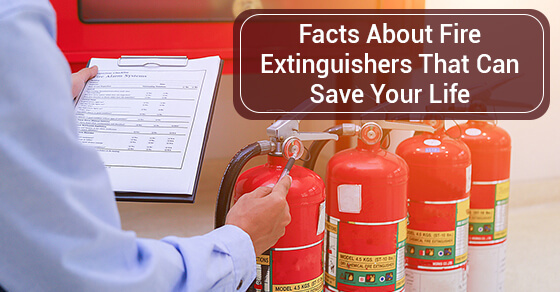 5 Fire Extinguisher Facts That Can Save Your Life | When we think about safety involving fires, it is quite common to think “fire is fire”. In fact, there are 5 different types of fire. This also means that not all fire extinguishers can extinguish all types of fires. For this reason, there are different types of fire extinguishing systems. Also called a fire control system designed to handle different fire situations. The more you learn about fire safety, fire fighting and fire extinguishing facts, you’re more than happy to deliver fire safety on your premises. Here are five facts about firefighters you need to know. Fact 1: The fire type before attempting to extinguish it. Class A: Trash, wood, cloth, paper and other ordinary combustibles start Class A fires. Class B: Gasoline, oil, propane, paint and flammable gases and liquids start Class B fires. Class C: Electrical equipment is always involved in Class C fires. Examples can include electrical short-circuiting and sparking from poor connections. Class D: Rarer Class D fires involve combustible metal alloys and metals like sodium, potassium, lithium, and more. Class K: Cooking fires are started by grease, cooking oils, animal fat, vegetable fat and similar materials. Fact 2: Eight different types of fire extinguishers. There are eight different types of fire extinguishers, although some are less well-known due to highly specialized applications. The eight types include water, foam, Carbon Dioxide, dry chemical, Purple K dry chemical, multi-purpose dry chemical, dry powder and wet chemical. Each type of fire extinguisher will have a symbol indicating which class of fire (A, B, C, D, K) it is designed to extinguish. It is absolutely vital to correctly match the type of fire extinguisher with the fire class, or you risk making the fire worse. Fact 3: Expired extinguisher is the equivalent of no extinguisher. Too many people still do not realize that extinguishers, just like other types of monitoring and alarm systems, need to be checked at least monthly to ensure functionality. An extinguisher left too long unused can expire. When an extinguisher expires, it will not work for its intended purposes when you rush to use it during an emergency. The process for checking an extinguisher is simple: check that the fire extinguisher is still in date, and ensure that it is still holding its charge. Then, you should check that the seal on the extinguisher has not been broken and that the pin is still in position. Check the nozzle to be sure it is clear, intact and free from damage. Finally, inspect the entire extinguisher to be sure it is free from damage or tampering. Fact 4: Training to operate extinguishers effectively. An extinguisher in the hands of an untrained individual can easily do more harm than good. Training must encompass all aspects of extinguisher operation in order to be useful, and this includes ensuring that your employees are strong enough to pick up, hold and operate the extinguisher. Even portable model extinguishers can sometimes be surprisingly heavy, and this is especially true when the user is trying to hold the device with one hand while operating it with the other hand. Training is also vital to equip each responsible party with sufficient knowledge to match the right type of extinguisher with the class of fire they are trying to extinguish. While this can be an easy enough lesson to teach in a classroom setting, during the initial stages of a fire emergency, it can be all too easy to forget. You must ensure that training reduces the likelihood your workers will panic, forget all about fire safety or pick up the wrong extinguisher or use an extinguisher in an improper manner when a fire breaks out. This usually requires regular safety and fire drills and re-training. In theory, operating an extinguisher is fairly simple, but without training, it can seem impossibly complex during an emergency. You can use the acronym PASS to teach your employees the basics during training. – P is for Pull the pin out at the top of the extinguisher. – A is for Aim the nozzle at the fire. – S is for Squeeze the hand of the extinguisher to send the contents towards the fire. – S is for Sweep the nozzle across the fire event at its base while slowly moving in towards the fire. The benefit for taking time out for regular fire training is that you will be far more likely to develop a group of workers with the skills and confidence to assist their peers and your company in a fire emergency. Fact 5: If employees can’t find the fire extinguisher, they can’t use it. Sometimes, companies are tempted to place fire extinguishers in hidden or highly inaccessible locations, either due to company aesthetics, perceived safety risks or simple lack of storage space. However, this will not serve you well if a fire emergency develops. The best case scenario will place extinguishers in highly visible, clearly labelled locations that are sufficiently low to the ground so that even shorter employees can easily reach them. Clear instructions in large print font should be printed and placed right beside the extinguisher sign. Fire training should also make sure your employees have experience with retrieving the extinguisher from its storage location. With regular drills and re-training, this knowledge will work its way into their muscle memory and become second-nature. There are other fire safety aides that should always accompany your extinguishers. Ceiling sprinkler systems, smoke detectors, fire monitoring and other aides can all ensure any fire emergency receives prompt and expert attention. For more tips on fire safety, give us a call at 03-7831 4791 or send us an email.